The Daily What is always good for a wander and just occasionally, it throws up something really rather spectacular. 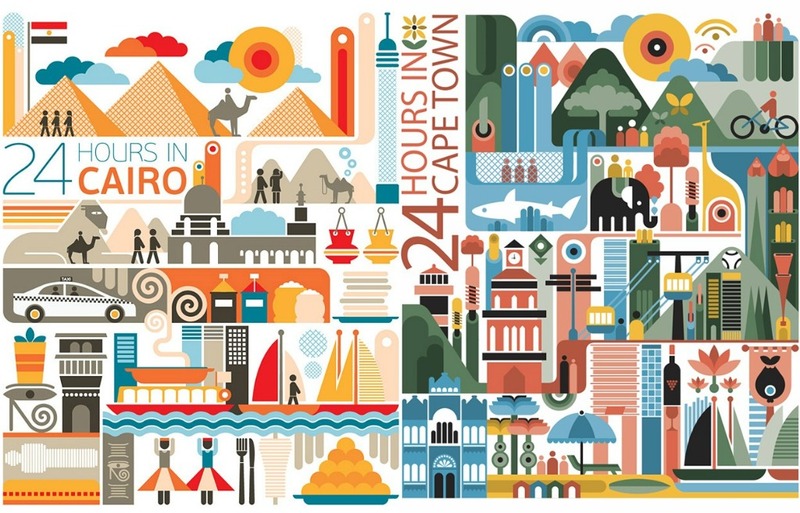 These gorgeous colour-soaked travel posters are the really rather spectacular that I’m thinking of. 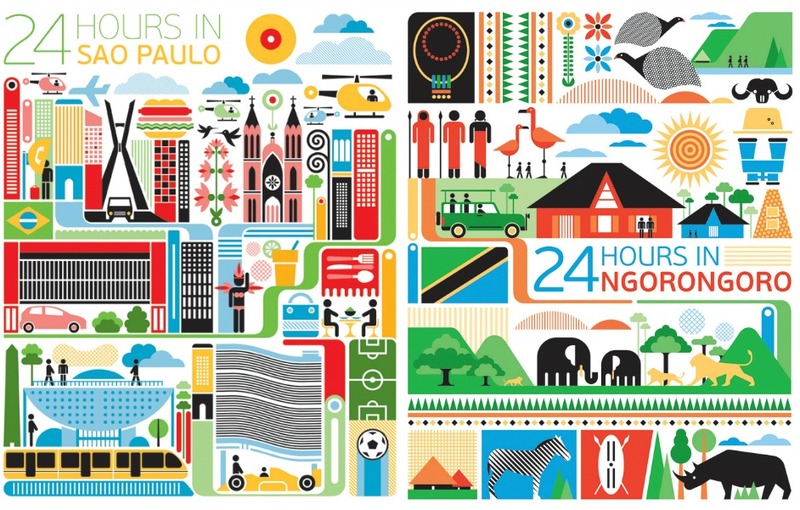 Designed by Brazilian illustrator Fernando Volken Togni for Oryx Magazine (Qatar Airline’s in-flight read), they encapsulate ‘24 Hours In…’ various cities around the world. 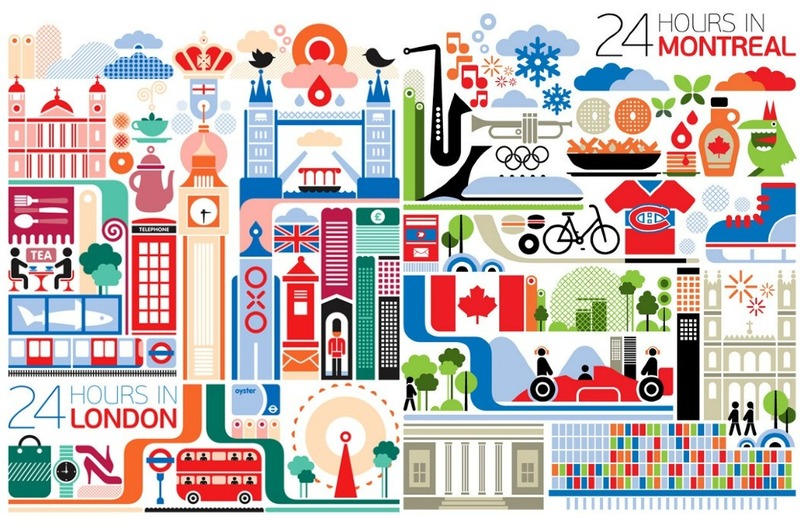 Bold, vibrant and bursting with energy, they’re like groovier Where’s Wally pictures – look closer and there’s all sorts of cute details hiding away. 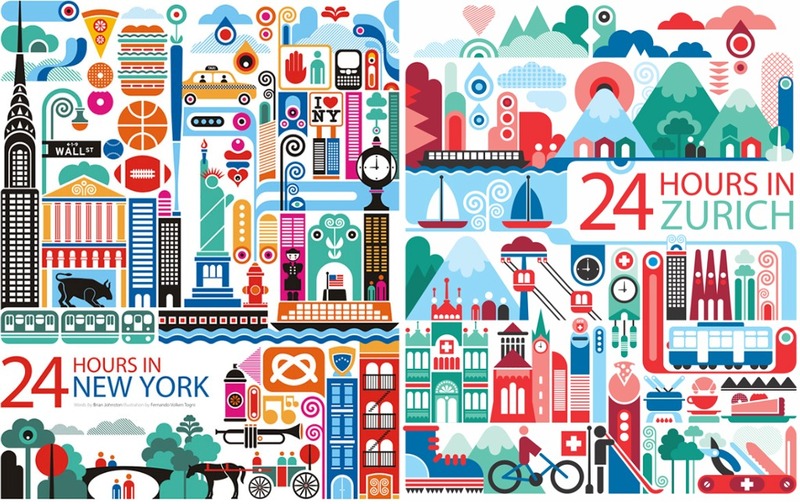 So there’s a Swiss Army knife in Zurich, a skyscraper-sized hamburger in New York and a panda poking out the trees in Shanghai. It’s almost like Pick n’ Mix at your local sweet shop – impossible to pick a favourite, you just want to feast on them all! 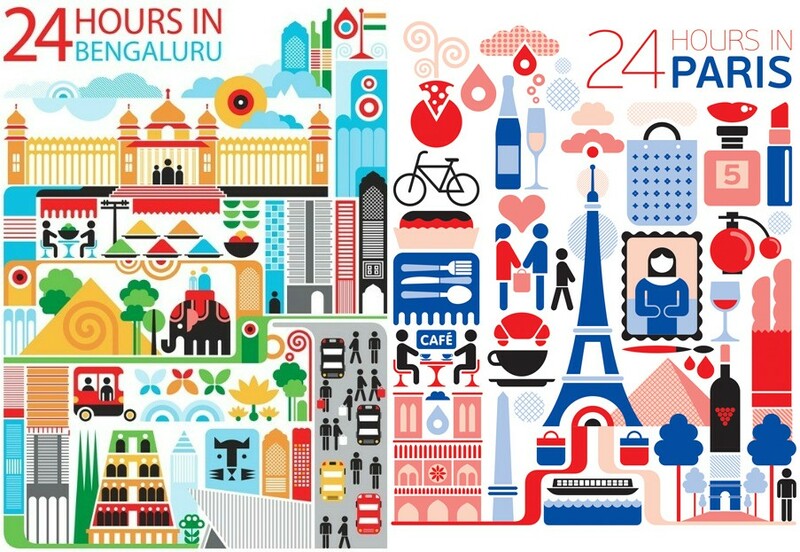 On the one hand, I love the ones that work with a particular colour palette – the lucky reds of Shanghai, the cool blues of Moscow, the faded vintage hues of Doha, the tricolour of Paris and the sun-soaked oranges of Madrid. 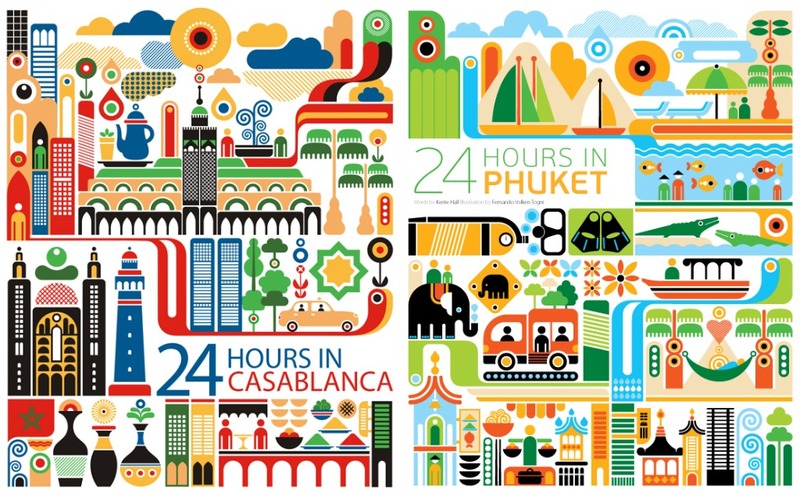 But on the other, I also adore the vivid brights of New York and Barcelona, whilst there’s something about Casablanca’s colour scheme that feels so irresistibly Moroccan without me being able to quite put my finger on it. Wasn’t able to spot Humphrey Bogart lurking in any corners though! 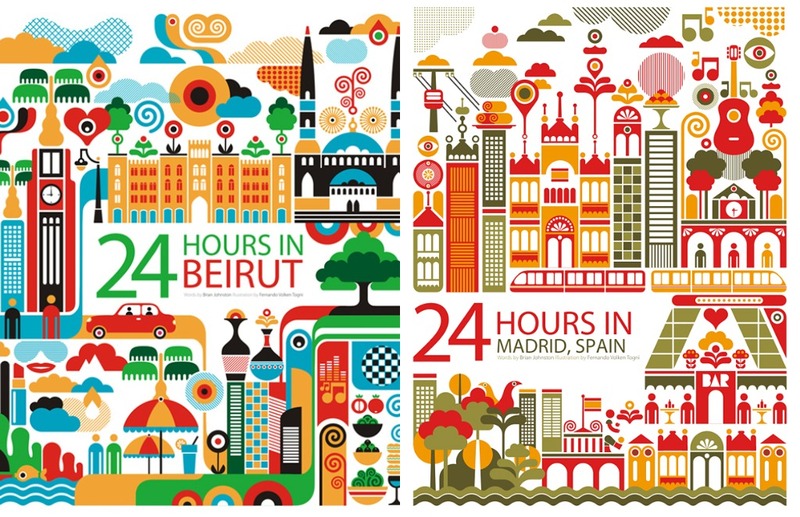 Eagle-eyed viewers may spot a slight similarity with some other travel posters I went similarly goo-goo eyed for (from Ikea, of all places). Togni’s style is a little cuter and a lot more action-packed, but I still love them both. You can check out plenty more of his candy-coated artwork, all fabulous incidentally, on his website, which is where all the pictures are from (don’t forget to click for enlargements). He promises they will be for sale soon, leaving just one problem: which one to buy?! 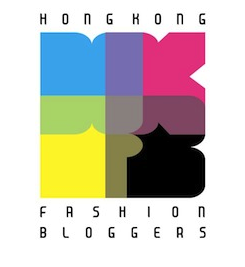 Next stop… Hong Kong, please! This entry was posted in Pretty Things and tagged 24 Hours In, art, design, Fernando Volken Togni, illustration, Pretty Things, quirky stuff, travel posters. Bookmark the permalink. Hello Rach, I am so glad with your post. It makes me really happy when someone like my illustrations. I am planning to sell all those posters soon, so I’m waiting for Oryx’s to start it. Thank you very much! Thanks for the comment and thanks for the beautiful designs! Look forward to seeing what cities you do next! 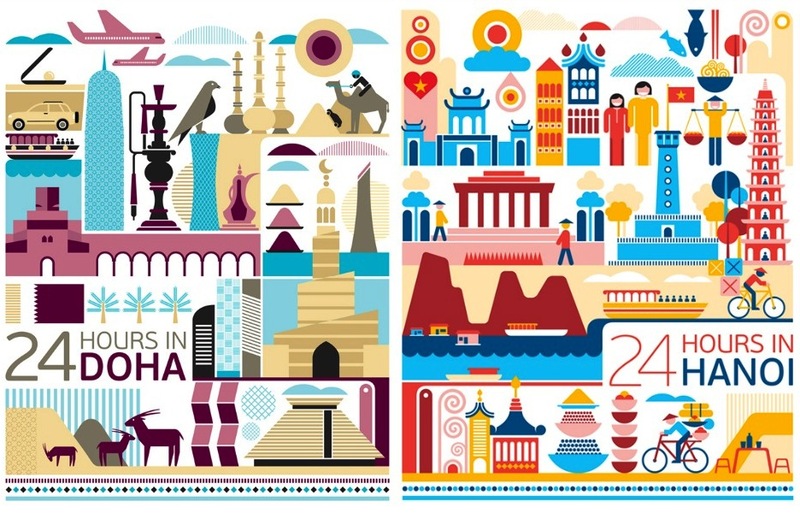 I WOULD LIKE TO BUY ALL OF THESE GORGEOUS TRAVEL POSTERS FERNANDO – WHERE CAN I PURCHASE THEM AND WHAT SIZES ARE AVILABLE PLEASE? THANK YOU RACHEL FOR DRAWING MY ATTENTION TO THIS WONDERFUL ARTWORK! I’m glad Fernado has another fan – may I suggest you contact him directly through his website http://www.fernandovt.com or email nandovt@gmail.com and hopefully he can help you out! 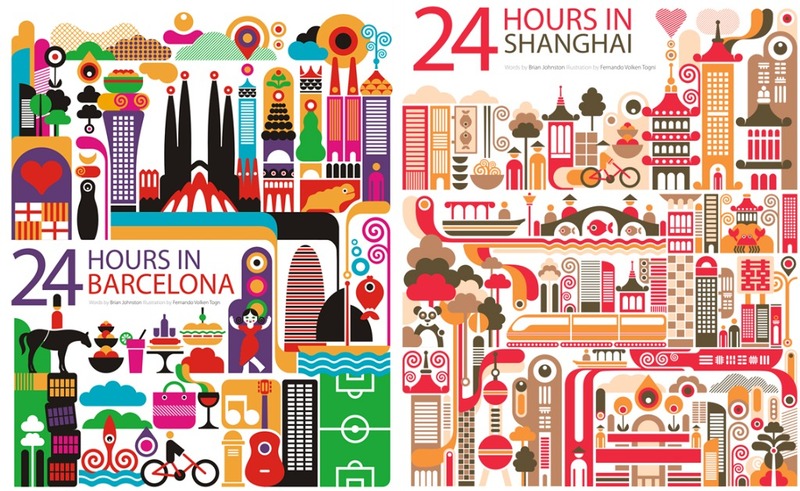 Let’s hope Oryx commission a 24 Hours in HK feature soon! Does Qatar even fly to HK? I guess that might be a start…!